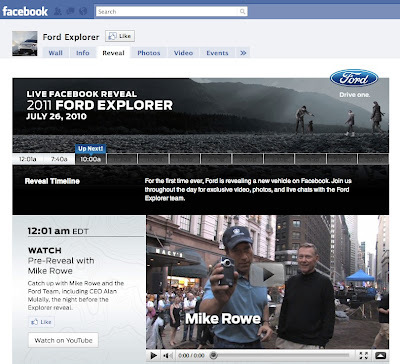 Today Ford became the first automaker to launch a new vehicle via Facebook — with 12 updates providing a striptease of the new, more fuel-efficient Ford Explorer. We noted earlier in a guest post at Brandflakes that Ford seeded the campaign with an estimated $200,000-a-day in paid online advertising (thus dissing Mashable’s love note that social media works solely on its own). But beyond the integrated advertising-supporting-social synergy, what we really like is Ford’s honesty. Honesty? That’s right. This entire bit is overtly promotional — there’s new sheet metal coming to the lots, boys! — and it’s all about selling the SUV. But that’s refreshing in a day when many brands resort to paying for tweets or shooting films of guys “walking across America” who really get there by van and hotel. One cause of cognitive dissonance in modern communications is consumers get confused when they can’t determine the source of information. This wasn’t always the case; in the past, advertising was obviously paid, so you judged it with your guard up, like evaluating the pitch of a car salesperson. Editorial was supposedly unbiased, the external news collected by an altruistic reporter, and you reviewed it with similar guard against the mind of the writer. But today’s paid posts? Sponsored tweets? Quasi viral-truths? That’s all so confusing. And the risk is all communications will become less persuasive as consumers wonder which upstream sources are trying to bend their minds. Ford ignored the temptation to pay people online to manipulate you, and instead paid for ads to invite you to a simple, clear social party. We find such honesty refreshing. We may not buy your truck, Scott Monty, but at least we can see where it’s coming from. Ben – Right on the money. Authenticity is the new authority. Luke Sullivan had a great post this week on historic authority in advertising. Social media should be a rush to the truth. I believe that the better a brand (or us personally) look, warts and all, while being 100% honest, the more successful your campaign will be. And – absolutely – social media can’t do it alone; there is way too much volume to get noticed. It’s possible but not likely. Yet, I have to ask, Was the Walk Across America presented as a real event? I think there is still room for cool. That behind the scenes spot kind-of spills the beans doesn’t it? We’re getting to be a pretty savvy group. Was anyone really fooled? In the case of “cool” can we sacrifice some authenticity and replace it with pure fun? Bruce, I agree. Never once thought the Walk Across America was real, nor did I feel they wanted me to believe it was. Thinking this is a deeper issue that Ben has with jeans… time for a little honesty.